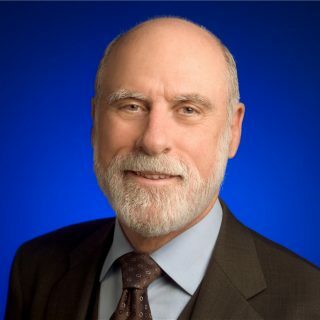 Google VP and Chief Internet Evangelist Vint Cerf spoke with WashingtonExec’s Julie Reiss about federal research investment and the STEM opportunities that shaped his young life and career. DARPA took a risk in the ’70s funding an applied research experiment that paid off in vast economic growth for the country — a computer communication system that became the Internet. Increasing federal research funding will provide more high-risk high-payoff returns, maybe even the next technological revolution. Vint talked about what inspired him into STEM, computing and eventually the ARPANET and INTERNET projects that changed the world. For decades ‘vint,’ as he signs off emails, has been an iconic tech figure for co-creating the net and is recognized now even in pop culture as a Father of the Internet. He credits his success to serendipity, and over the years, has received a lengthy list of honorary degrees and international awards. In our discussion, Vint gave insights on his testimony before a Congressional hearing on R&D funding. This past summer on July 17, he testified before the Senate Commerce, Science and Transportation Committee hearing on “The Federal Research Portfolio: Capitalizing on Investments in R&D.” Led by Senator Jay Rockefeller, the hearing examined federal R&D funding levels as a result of the America COMPETES Acts of ’07 and ’10 that increased key R&D budgets aimed at research, STEM initiatives and innovation. At his Reston Google office, Vint spoke highly of DARPA, the agency that in 1968 funded the ARPANET project, and later Bob Kahn’s “Internetting” project to create the TCP/IP foundation of the Internet. Vint noted that the agency has been taking on risky projects since 1958. They have “an incredible track record” of innovative breakthroughs as a direct result of all that investment. He boldly said to his 5th grade teacher Mr. Tomazewski, “The math is boring.” Recounting the story with a laugh, Vint said his teacher gave him a 7th grade math book of algebra word problems and added, “Teachers can make an enormous difference both challenging students and exciting their interests.” All summer he had fun not just solving, but manipulating scenarios in his mind to uncover the mystery ‘x.’ He read a lot of books and imagined ‘x’ to be like another mystery novel to solve. Figuring out each mystery scenario in his imagination, he developed a playful approach to algebra and still likes finding the little ‘x’ in word problems. This game-like approach to problem solving is something I noticed in engineers from the mid-90s InternetMCI Engineering group that had some overlap with Vint’s group on the same floor. A playful team approach to solving internet architecture issues was business as usual. In small meetings, an engineer at a whiteboard would scratch out rapid-fire circles and connecting lines, while a handful of engineers focused intensely on the problem. Within minutes they’d find humor in what only this group would understand, followed by a round or two of laughter. Considered one of the golden groups for their cutting-edge tech and ability to produce results, this successful working group saw resources thrown at them by upper-level executives. Several engineers in the department, which grew from three engineers to more than 40, went on to lead companies. These memorable work sessions were a team game of problem solving in which they weren’t competing against other teams. Instead, they were having fun figuring out how to quickly move the ball forward together, one brainstorm and laugh at a time. Today Google’s Reston office features a putting green, white board walls for doodling, bean bag chairs, colored lanterns, and in Vint’s words, “big bouncing beach balls,” encouraging fun interaction at work. From his office full of toy alligators — a reference to MCI Mail days when he used to say, “I’m up to my ‘rear end’ in alligators” — Vint recalled a number of significant events that cascaded to shape his future at the age of 15 in the latter part of 1958. He visited a family friend at Stanford, met some professors and aspired to attend the state’s top school. With much enthusiasm, he talked about taking a Master’s Course with Master Cellist Pablo Casals. Shortly thereafter, Vint’s father took him to view what they called the SAGE — Semi-Automated Ground Environment computer at System Development Corp. Seeing the massive million dollar computer was an unforgettable experience. Watching it perform what his father’s friend had programmed and imagining it’s potential was more fascinating than anything else, even playing the cello. Vint revealed that he didn’t have time for both cello and computing. He had to make a choice and advised, “Do something really well to be successful.” His father Vint Sr. was an aeronautical executive who made it clear to Vint and his two brothers that their father had earned top grades in school. Vint strove to keep up with his dad’s record. If someone challenged Vint by saying he couldn’t do something, he worked tenaciously to disprove them. At 17-years-old at Van Nuys High School, his best friend Steve Crocker got permission from the head of the UCLA Engineering Dept. to use the computer — a fridge-sized Bendix G-15 that was fed with paper tape and needed a nearby teletype machine. On weekends they would go to UCLA to program the “Bendix G-15.” This serendipitous turn of events that he had easy access to programming — or not so easy as once they had to scale a wall and go through a window — was another spark that ignited his interest in computing. All through high school, his paid summer jobs (not called internships) were at North American Aviation (NAA), which became Rockwell International, and Rocketdyne. Vint looks back with gratitude at winning a full 4-year scholarship to Stanford from NAA, studying math and German. At UCLA, he “benefitted from many opportunities” teaming up again with Crocker, getting grad-level support from advisors Jerry Estrin and Len Kleinrock, and meeting Bob Kahn. Bob had been with a company called BBN (Bolt Beranek and Newman) for over a year. Through BBN, Bob had proposed and delivered to ARPA the design for the IMP (Interface Message Processor), later known as ARPANET. Looking back at his STEAM-focused upbringing and success with the networking applied research experiment that became the Internet, Vint credits serendipity. Since co-creating the platform that has significantly changed the way business and government function and individuals communicate, he has continued to work on web applications: security, privacy, resilience, safety, international governance, expansion to developing countries and creation of a variant of the Internet Protocol in Space — a Jet Propulsion Lab project to enhance networking in outer space. This past July, the same week he testified on Capitol Hill, Vint appeared as a guest on Comedy Central’s The Colbert Report. Stephen Colbert and others have noted a likeness of Vint, complete with 3-piece suit, to a character from a 2003 movie, Matrix II. Vint’s sons David, a TJ graduate, and Bennett are now film makers in his home state of California. This year, Vint and Sigrid celebrate their 48th wedding anniversary. Reflecting on his young life and career, his biggest regret is not continuing with cello at age 15 when he discovered computing. It’s the regret of many that they didn’t continue with an instrument, but the world wouldn’t be the same if Vint had decided to study more cello, or if DARPA hadn’t funded a high-risk research experiment that’s revolutionized the way we all communicate.